There’s a vast pile of recently published personal finance books on my desk. I just calculated the ratio of books written by men to those written by women at 6:1. Among investment advisers, about 80 per cent are men. A recent survey found that just 10.3 per cent of a sampling of 16,084 global portfolio managers were women. In personal finance and investing, male perspective is everywhere. 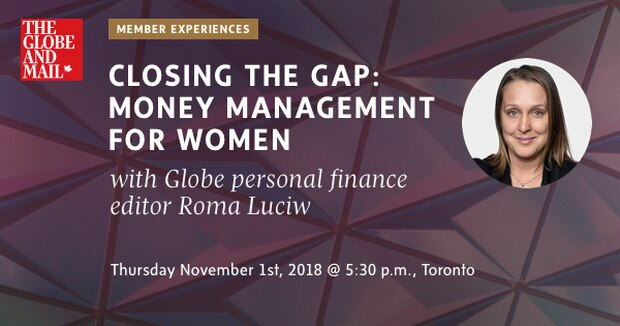 On Nov. 1, the Globe and Mail will host an event called Closing The Gap: Money Management for Women. Globe personal finance editor Roma Luciw will moderate a discussion with three financial planners, Rona Birenbaum, Jackie Porter and Shannon Lee Simmons. You can register for the event here – but note that you have to be a Globe subscriber to attend. If there are any questions you’d like to have the panel address, send them to Ms. Luciw at rluciw@globeandmail.com. Here’s a link to the Globe’s women and investing page, also for Globe subs. There’s one big exception to the dominance of men in personal finance – blogs. Women have some of the strongest franchises in personal finance blogging right now. There were lots of noteworthy responses to a newsletter last week about Toronto-Dominion Bank’s plan to automatically given a discount on some monthly account fees to seniors and reimburse clients for discounts there were entitled to but didn’t claim. Bank of Montreal said it has long been auto-enrolling eligible clients for a discount on account fees when they turn 60. And then there were the e-mails from seniors who oppose the senior’s discount. His stock portfolio fell by $75K – is he worried? Nope. Best-selling personal finance author Ramit Sethi explains here why he didn’t touch his portfolio, even as it fell sharply. I knew swimming pools would be on this list, but not sunroom additions. I always look for something sort of original in lists like these. Some underexplored expenses covered here include spending too much money on pop and buying snacks at the movies. Find out why in this well-researched article. Preview: A lack of pensions, expensive houses, supporting adult children and forced early retirements are all part of the story. A blog called The Measure of a Plan has created a do-it-yourself guide to personal finance. A good overview for beginners and intermediates. Q: I'm approaching the mandatory age for transferring to registered retirement income funds. Should I be switching out of stocks to bonds as I will have to start annual withdrawals? A: Not necessarily. Providing you can accept the risk of near-term losses, there’s a good case for keeping some stock-market exposure in your RRIF. You have to convert a registered retirement savings plan to an RRIF by the end of the year in which you turn 71. If you’re in good health now, you could live another 20 years or more. Exposing your portfolio to the long-term growth potential of stocks would help ensure your money lasts. The old formula for deciding how much stock market exposure to have was 100 minus your age. Today, with people living longer, there’s a view that 110 minus your age makes more sense. Do you have a question for me? Send it my way. Sorry I can’t answer every one personally. Questions and answers are edited for length and clarity.